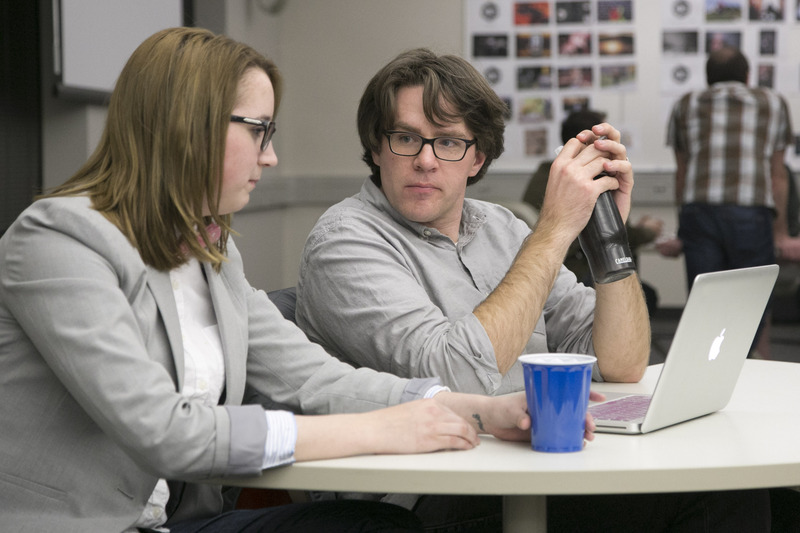 Kent State NPPA | Photos and stories featuring the work of Kent State photojournalists. 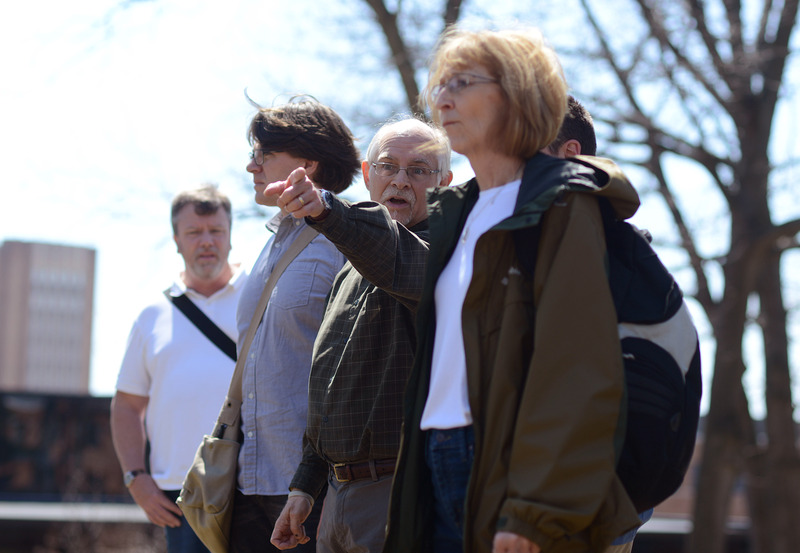 Photos and stories featuring the work of Kent State photojournalists. 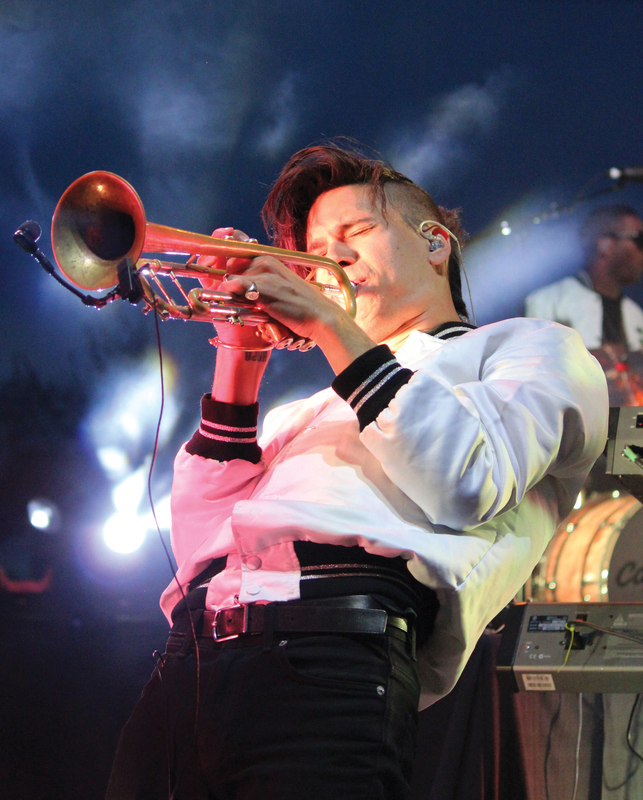 Spencer Ludwig, from Capital Citites, plays trumpet at the twentieth annual Kent State Flashfest on Thursday, April 24, 2014. 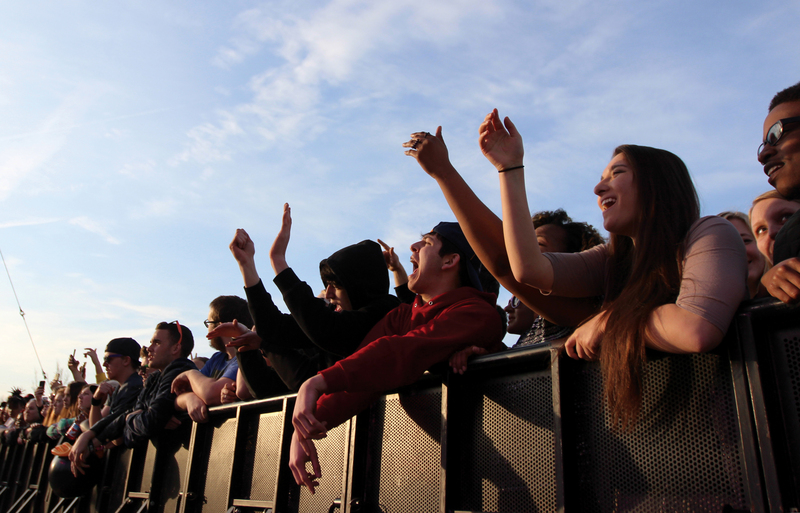 The front row of Kent State students during Ab-Soul. Ab-Soul performed right before the headliner at the 20th anniversary of Kent State Flash Fest on April 24, 2014. 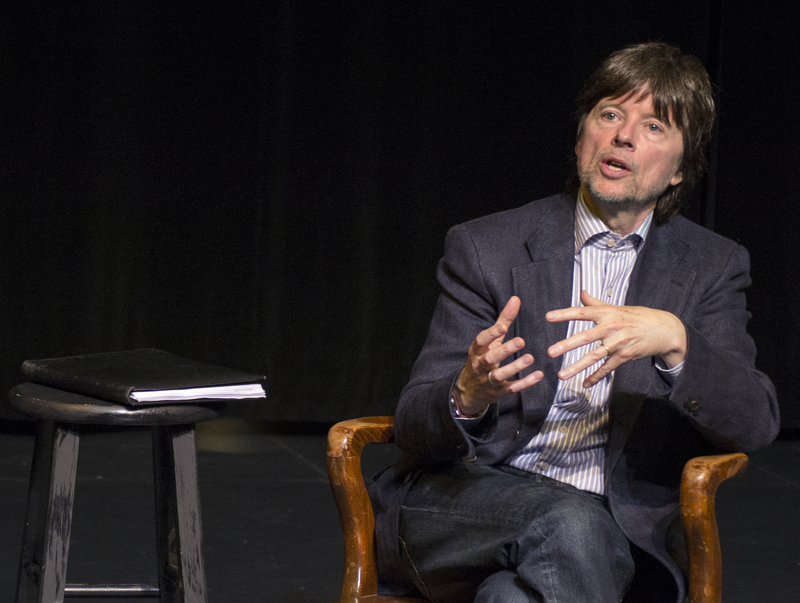 Ken burns attends a question and answer session with students and faculty in the Center for the Performing Arts’ Black Box theater ahead of his presentation as part of the Presidential Speaker Series on Tuesday, April 22, 2014. 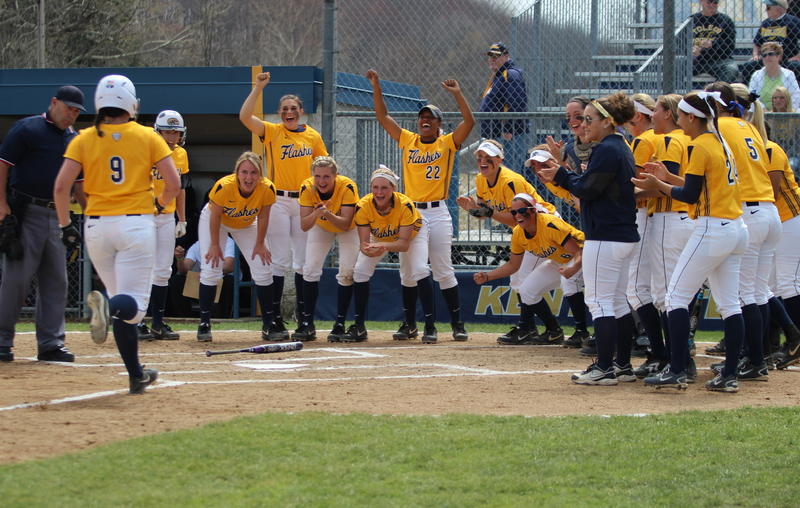 Kent State softball infielder Maddy Grimm runs through home plate after she hit a home run in the first game against Toledo in a double-header on Friday, April 18, 2014. The Flashes won 13-0 the first game and 1-0 the second game. 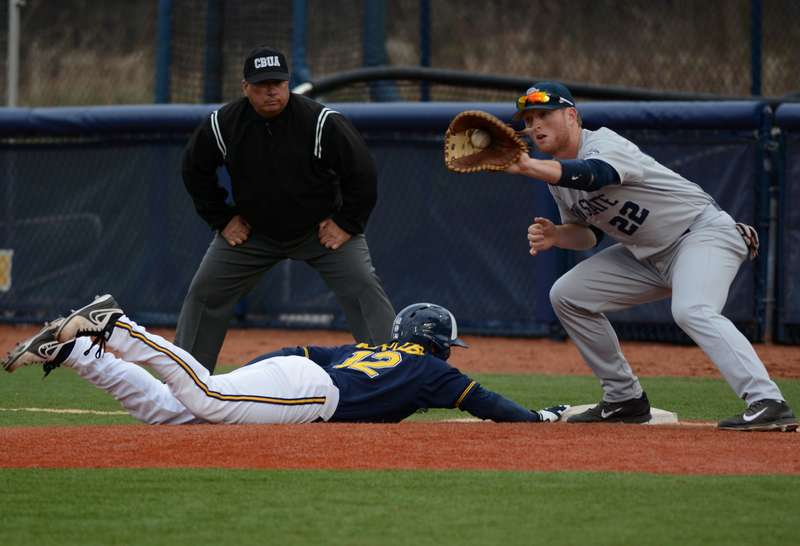 Junior outfielder Alex Miklos dives back to second base after attempting to steal during the baseball game against Penn State on Tuesday, April 22, 2014. The Flashes won the game 4-1. 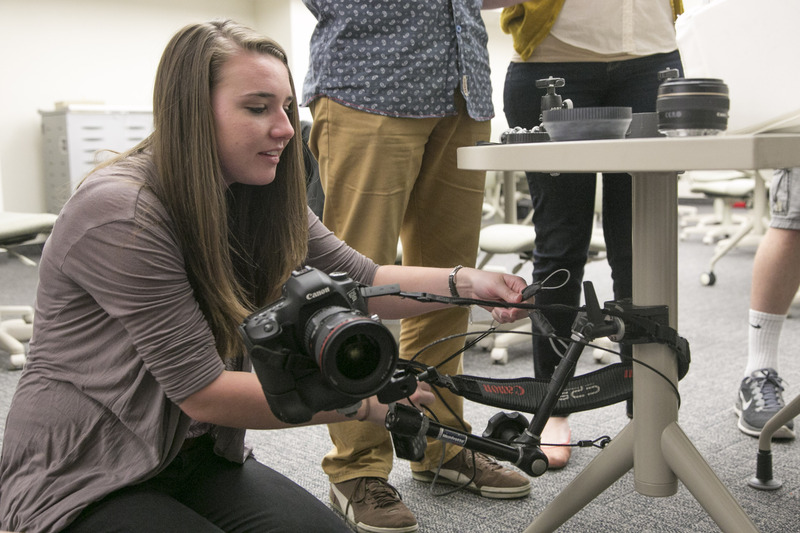 The Kent State photojournalism program along with the student chapter of the NPPA had the pleasure this past weekend of hosting the annual judging for ONPA. The judging itself took two days, with the final day reserved for the guest speakers and the award ceremony. Kent State and other college students also enjoyed the opportunity to learn at workshops and have their portfolios reviewed by industry professionals during the event. The Golden Flashes were well represented this year in the competition. Junior Jacob Byk was awarded the James R. Gordon Ohio Understanding Award for his photo story “The Fracturing of Green County”. Jenna Watson, also a junior, was awarded the Larry Fullerton Photojournalism Scholarship for a portfolio of her work, and received an award of excellence in the sports feature category. Freshman Andrea Noall took home an award of excellence in the pictorial category for her “Morning Fog” photo. 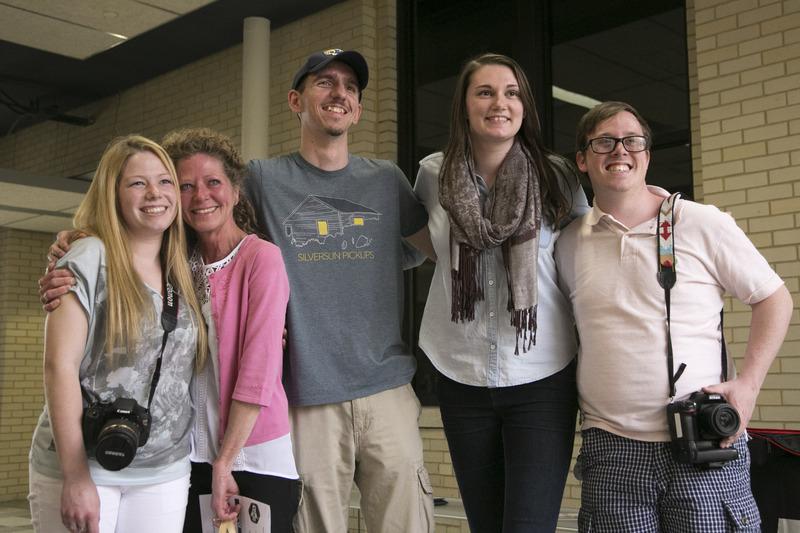 Recent alumni and alumna of Kent State also took home awards for their work. Kristen Bauer, who now works at the Elyria Chronicle Telegram, received an award of excellence in the feature picture story about a family moving out of low-income housing. 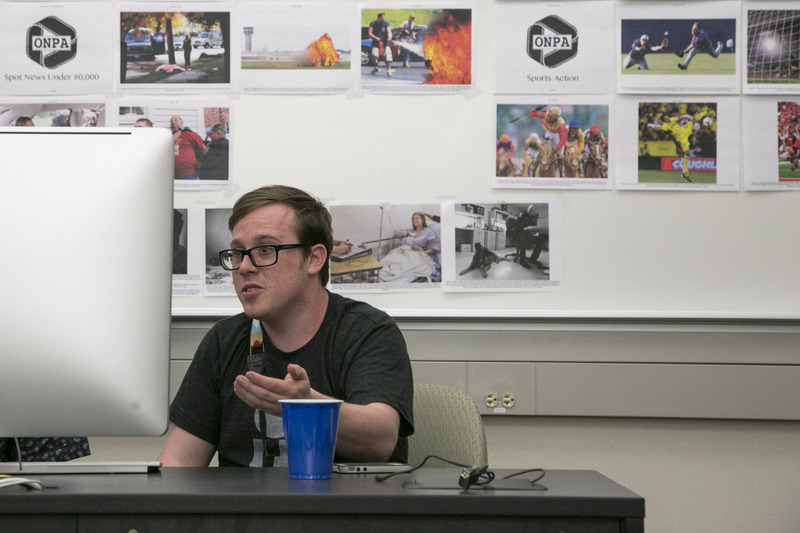 Awards of excellence were also given out to Coty Giannelli in the news picture story category for his coverage of the conflict in Syria, and Shane Flanigan for product illustration. To see the images that won this year please visit onpa.org to see the award winning images. 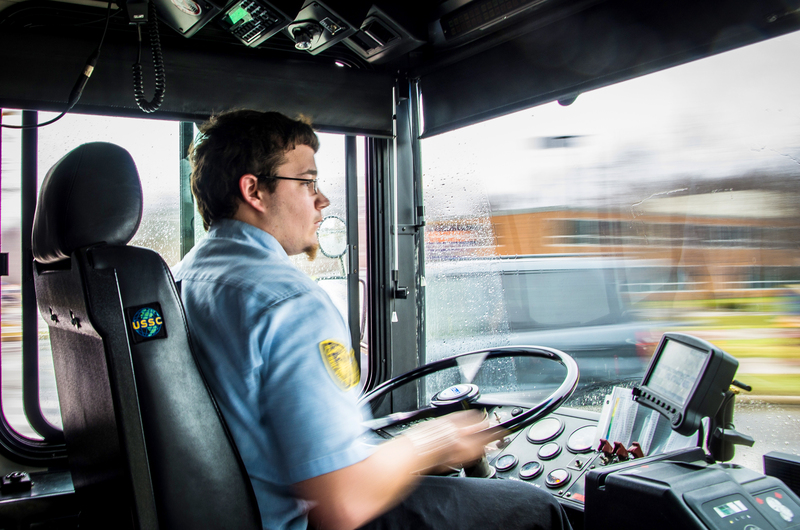 Student Stephan Ringler drives the PARTA bus through front campus on April 3, 2014. 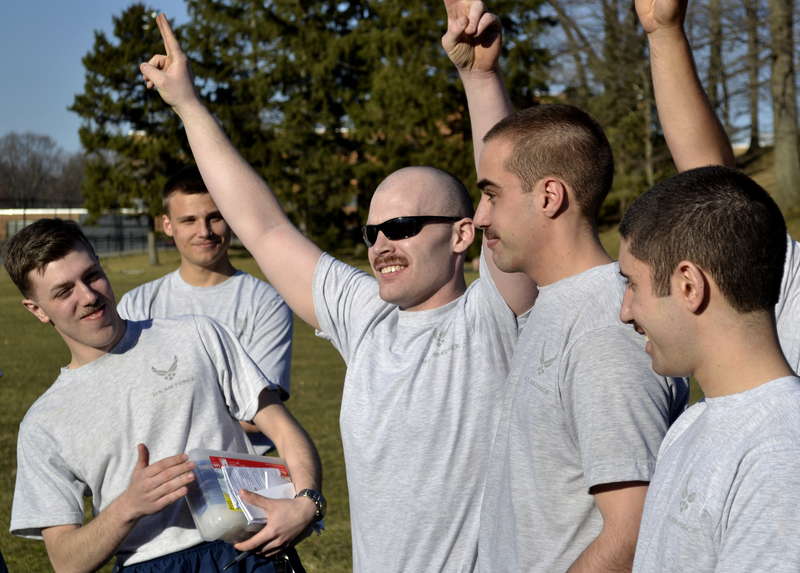 Senior Jerrod Mertz celebrates after the Airforce ROTC cadets vote him the winner of their mustache march competition on Tuesday, April 1, 2014 outside Taylor Hall. 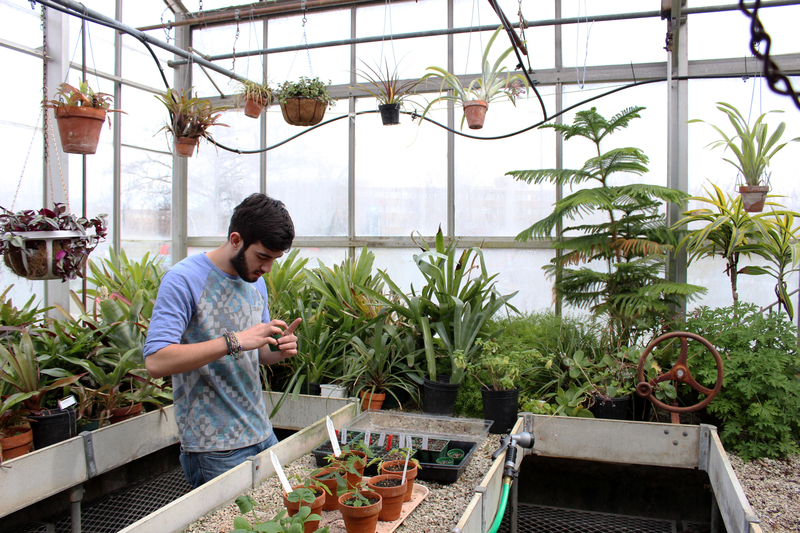 Kent State sophomore botany major Brandon Ashcraft works in the Kent State greenhouse on April 2, 2014. Ashcraft is inspecting plants that he recently planted. Euro Gyro cook Bill King shaves meat for a gyro Wednesday night, April 9, 2014. Euro Gyro took first place in Best of Kent’s category best drunk food. 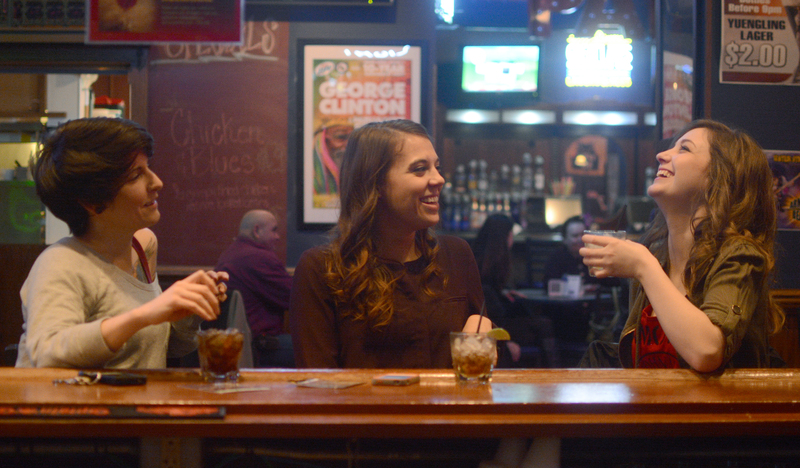 Kent State alumni Kat Kasee, Erika Knopsnider and Erin Duffy enjoy the $2 happy hour in Water Street Tavern on April 9, 2014. 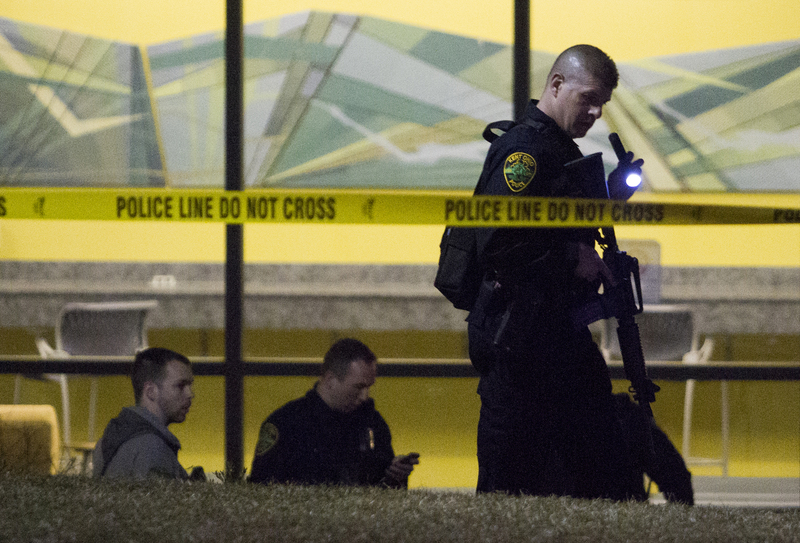 A law enforcement officer searches for evidence outside of Bowman Hall following a shooting at Kent State University, Wednesday, April 2, 2014. 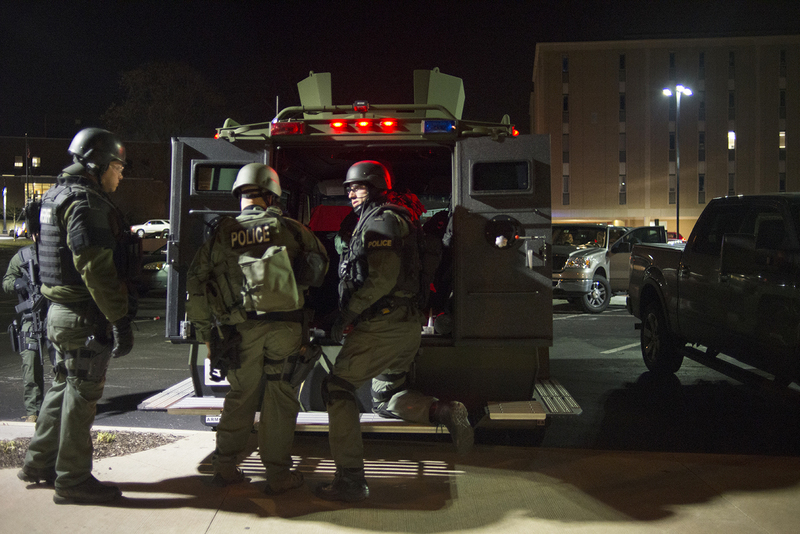 SWAT team members gather on the Kent State campus following reports of gunshots on April 2, 2014. 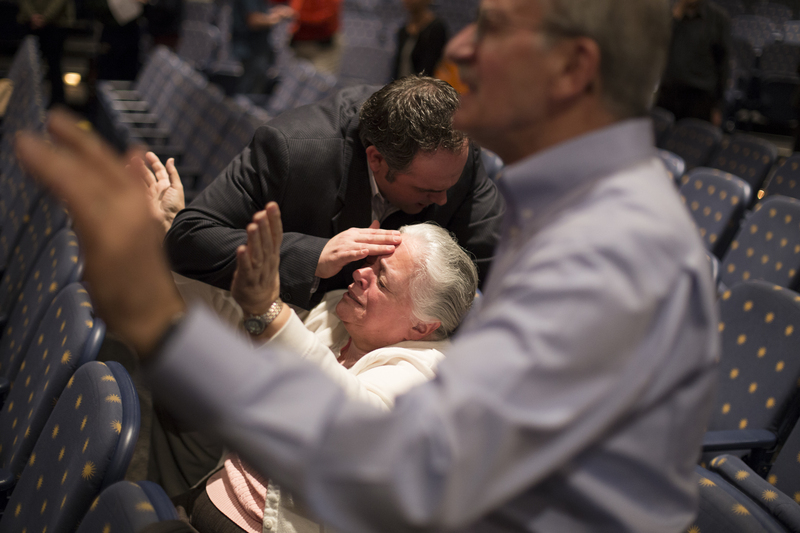 Pastor Joe Ellis prays with Charlotte, and her husband Royd Shafer, for her bad knees during Prayer Night Against Cancer in the KIVA, April 1, 2014. Charlotte and her husband attended the event for Royd’s uncle in North Carolina who suffers from lung cancer. 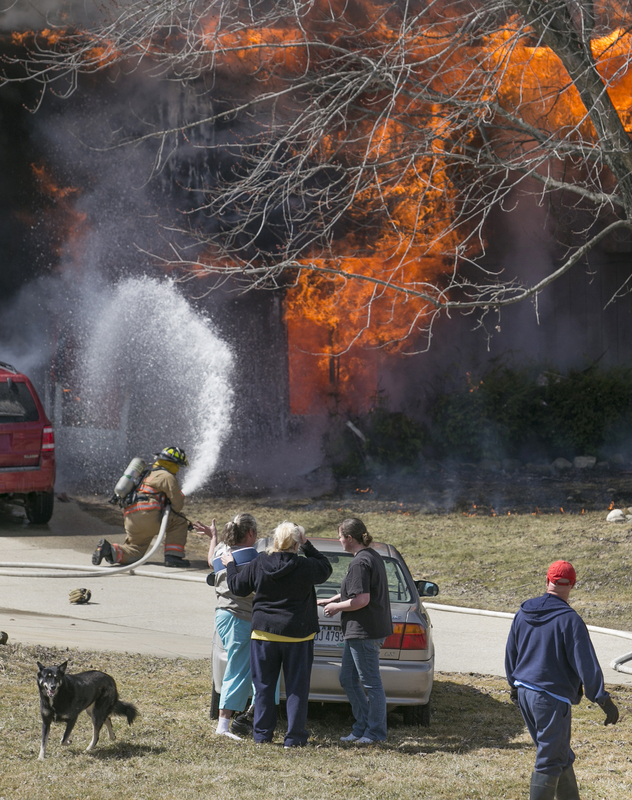 Family and friends comfort Daleanne Hyre as she watches firefighters tackle a blaze at her duplex home on May Road in Suffield Township on Monday, March 31, 2014. Hyre was in the duplex when the fire broke out and escaped with her cat and dog. 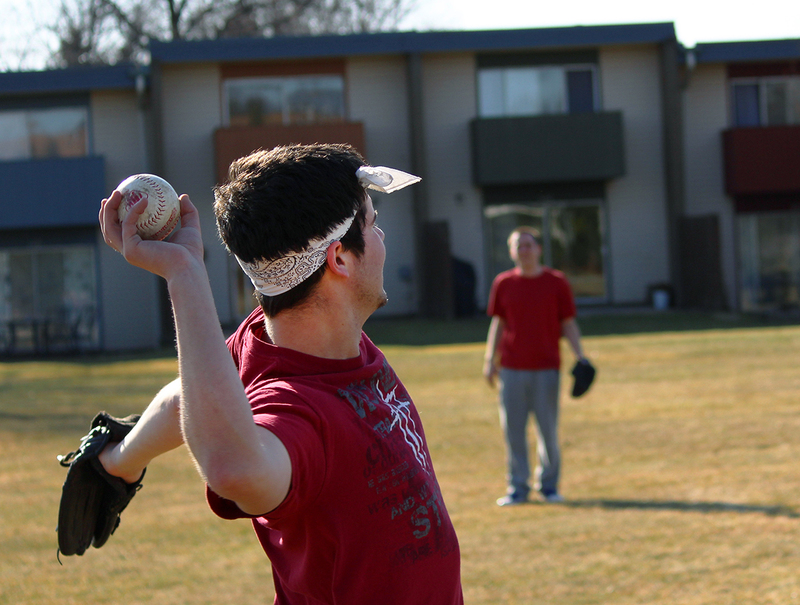 Kent State student Nick Mock enjoys the weather by practicing with his first co-ed intramural softball team, “Sons of Pitches”, in preparation for their first game, April 1, 2014. 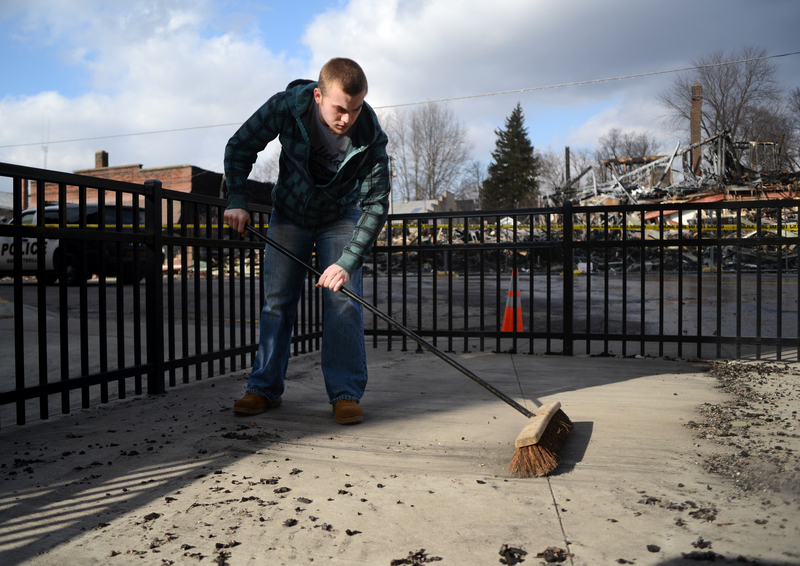 A chef at the Main Street Grille and Brewing, in Garrettsville, Ohio, sweeps ash from the patio on Monday, March 24, 2014. The fire on March 22 burned 13 businesses to the ground. Cody Koch outs Oakland’s Trent Pell during the first doubleheader on Tuesday, April 1, 2014. Kent State won both games 16-5, 16-1. 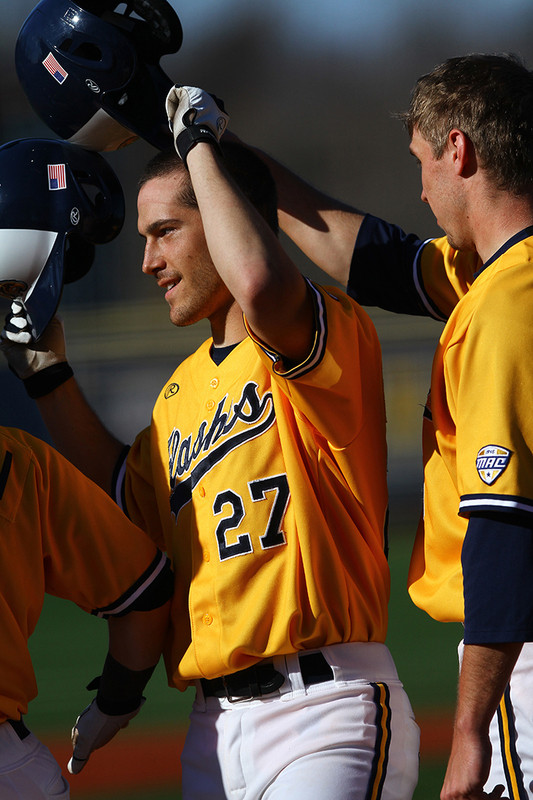 Kent State Junior Jeff Revesz celebrating with his teammates after sending a grand slam over the fences during the first inning of the second game of the doubleheader against Oakland. 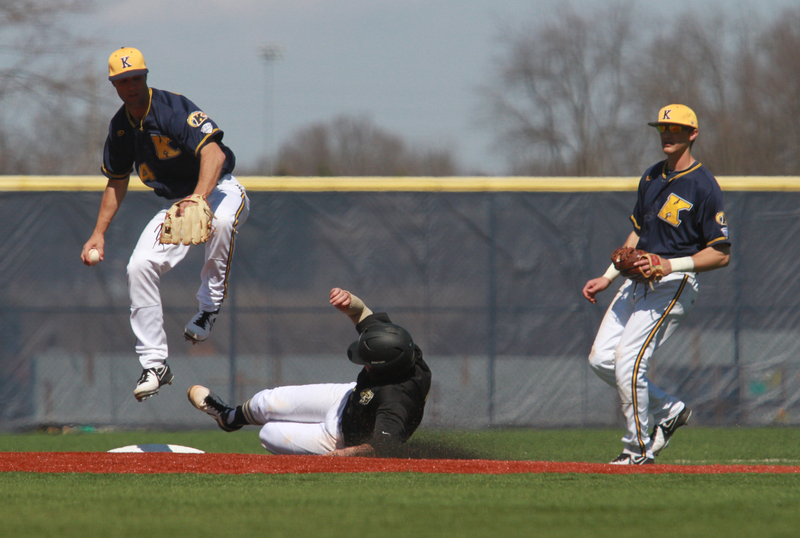 Flashes went on to win 16-1, Tuesday, April 1, 2014. 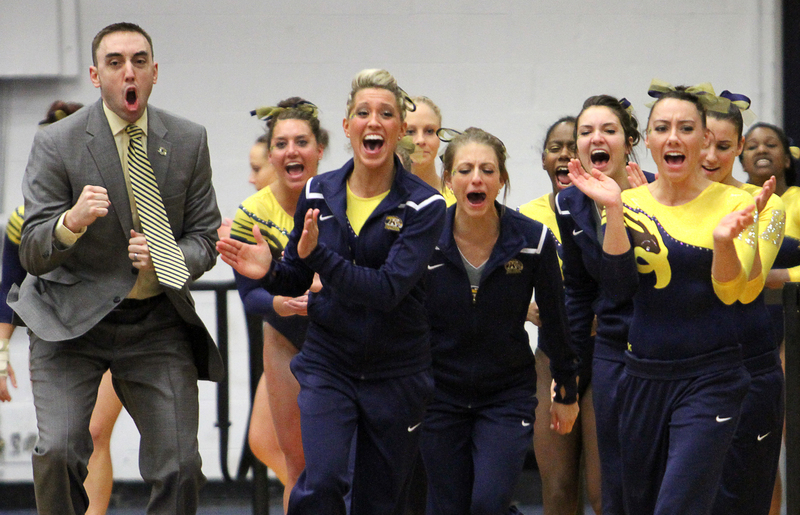 The Kent State gymnastics team and assistant coach Craig Ballard cheer after a gymnast lands her dismount off the vault. The team ended its regular season Saturday, March 15, 2014, with a second place finish at the Fitzgerald Field House in Pittsburgh, Pa. Kent State’s final score was 195.975. A Kent State gymnast grips the bar as a cloud of chalk fills the air during the beginning of her uneven bars routine on Thursday March 6, 2014. 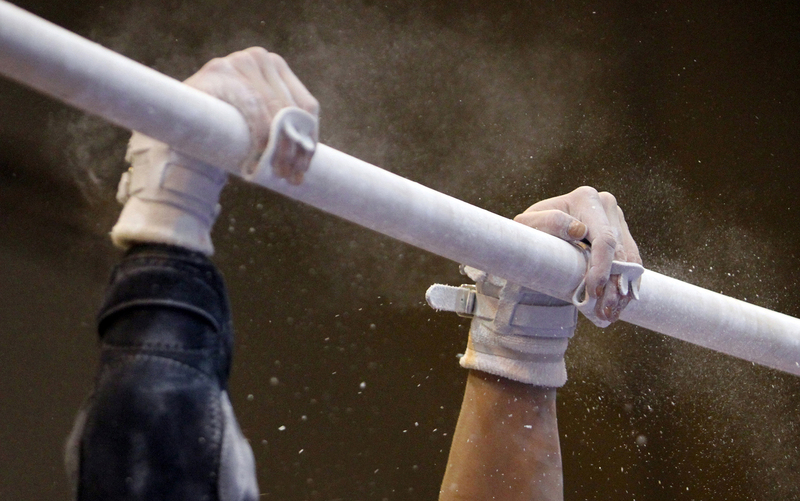 Gymnasts typically use chalk to help absorb sweat, so their grip is improved. 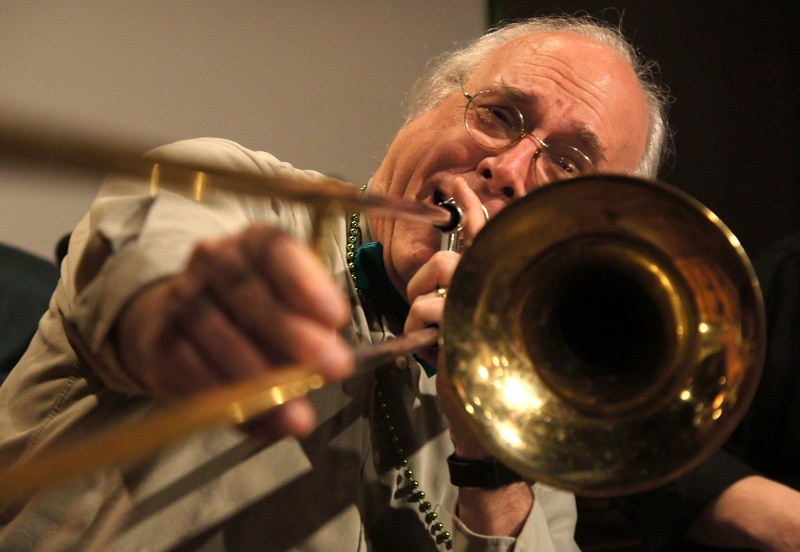 River Street Minstral trombonist, Steve Ostrow, jazzes up the Secret Cellar for St. Patrick’s Day downtown, Monday, March 17, 2014. 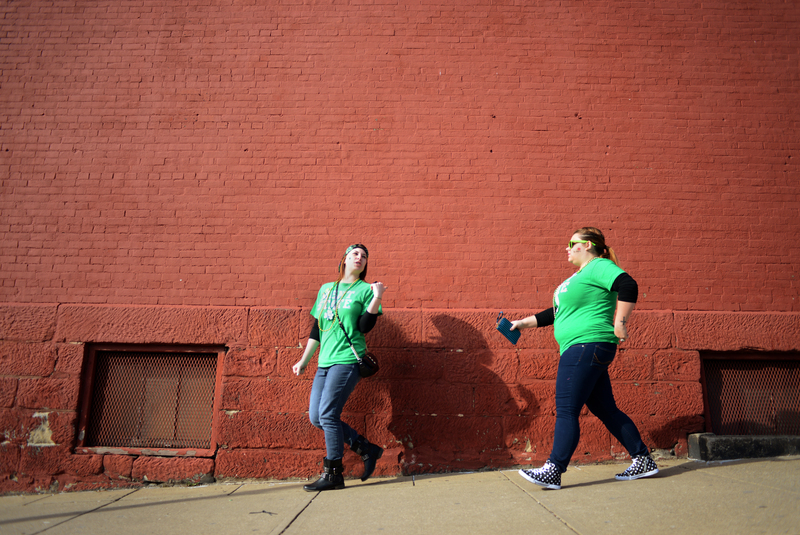 Tessa Lentz, senior fashion merchandising senior, and Jordan Jones, senior entrepreneurship major, bar hop on March 17, 2014 in downtown Kent for St. Patrick’s Day. 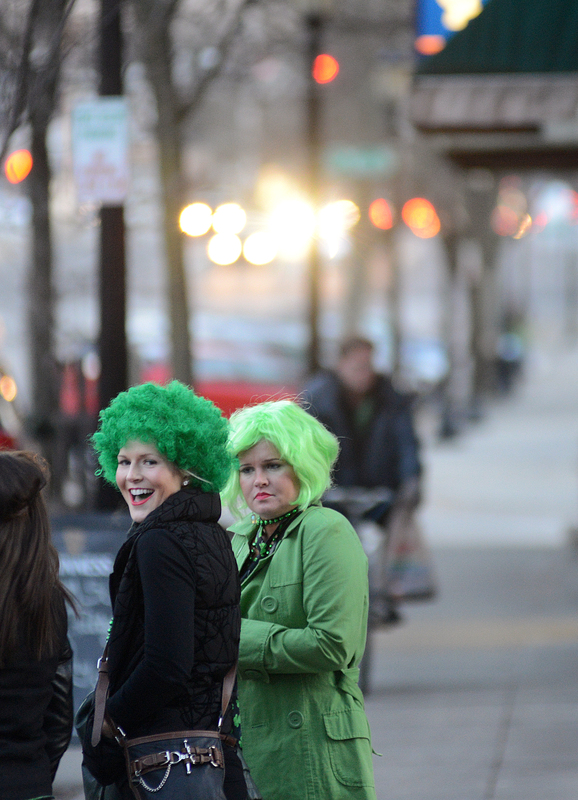 Two green-wigged bar-goers enjoy the celebration downtown for St. Patrick’s Day, Monday, March 17, 2014, just after sunset. Kent State’s Michael DePalma faces his final opponent at the match during the 2014 MAC Championship wrestling meet on Sunday, March 8, 2014 in the M.A.C. Center. DePalma’s final defeat against an Ohio University player wins him third place in his weight class. 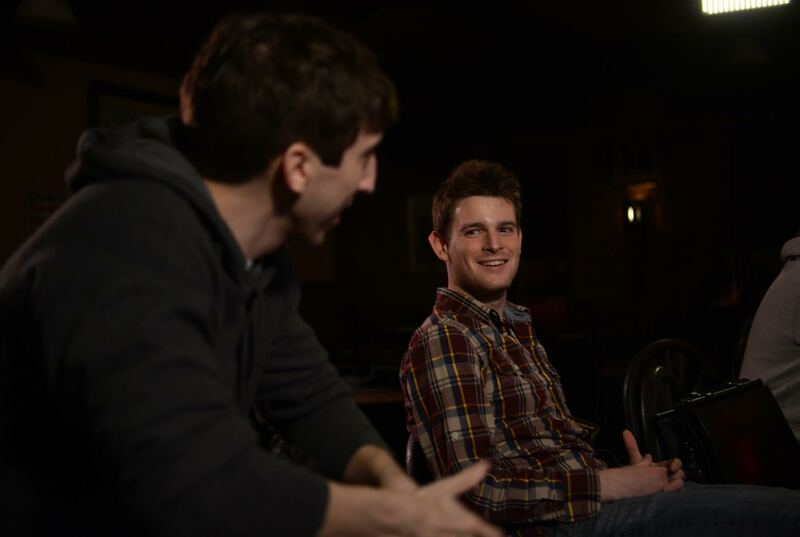 Jesse DiFranco, who plays the main character Austin in the student produced web series “Second Time Around, talks with one of the producers, Matt Petrunak, while shooting an episode of the series on March 9, 2014 in Ray’s Place. 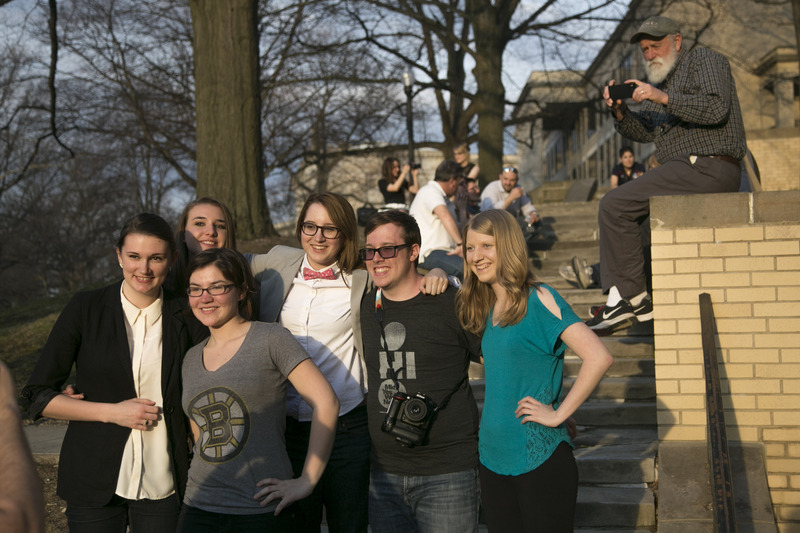 Members of the Kent State NPPA are back after a long road trip to Warwick, Rhode Island this past weekend. 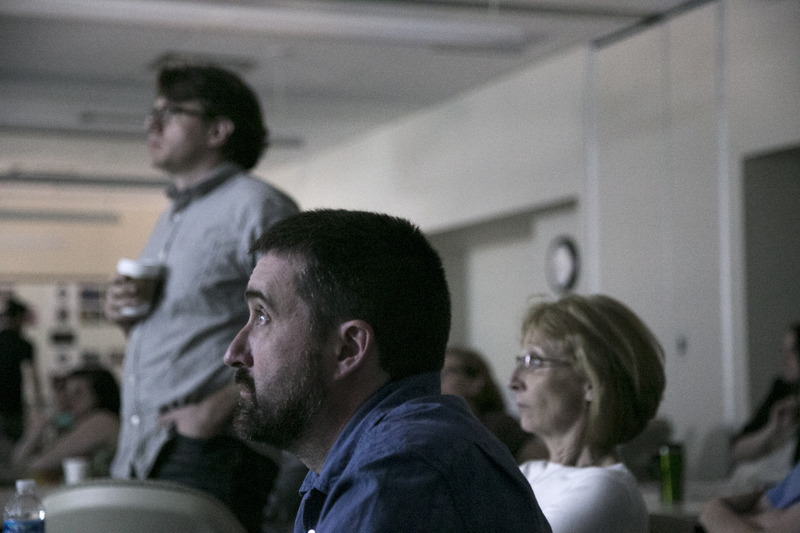 The members attended the 33rd annual NPPA Short Course where they heard lectures from National Geographic photographer Ami Vitale and Pulitzer Prize winner John H. White, along with many others. 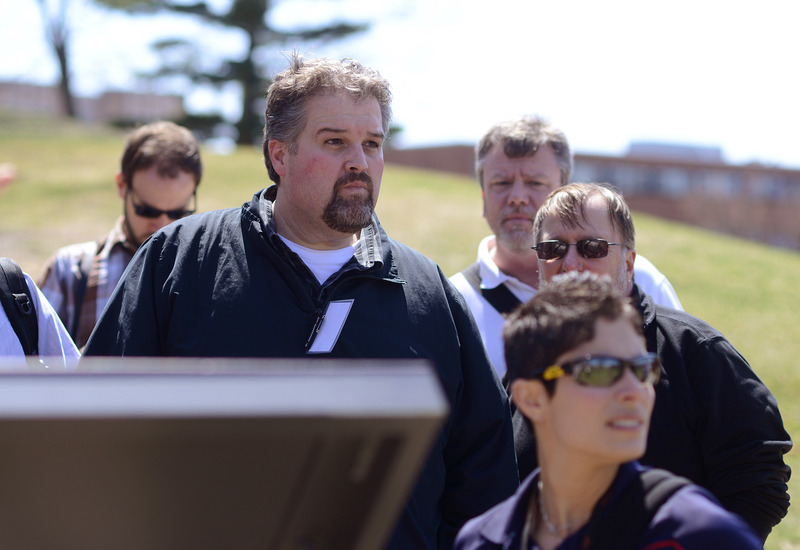 There were also opportunities to participate with hands on activities such as location lighting and flying a quad copter with a GoPro camera mounted to it. 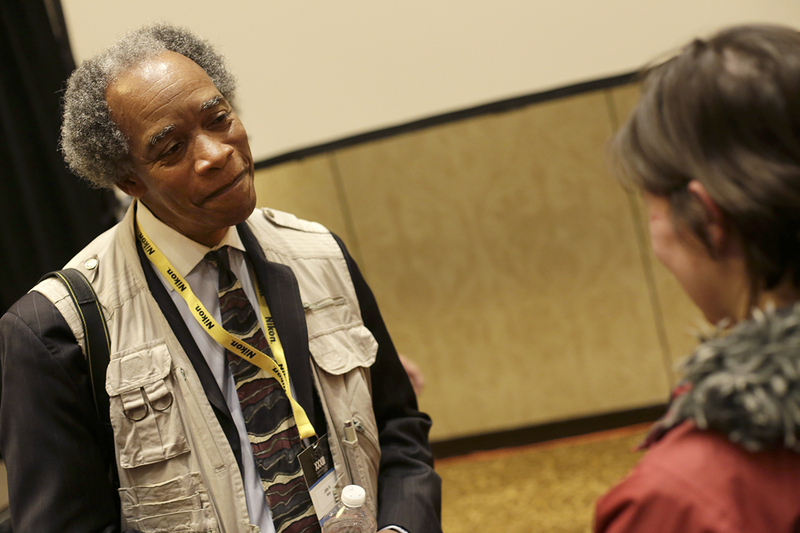 John White took the opportunity between lectures to talk with many members of the Kent State NPPA. 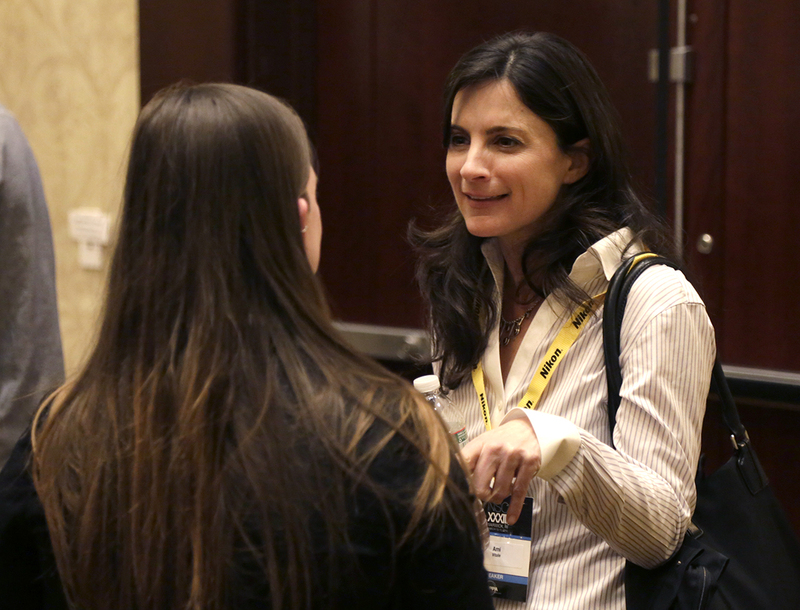 Here sophomore Melanie Nesteruk chats with the Pulitzer Prize winner. 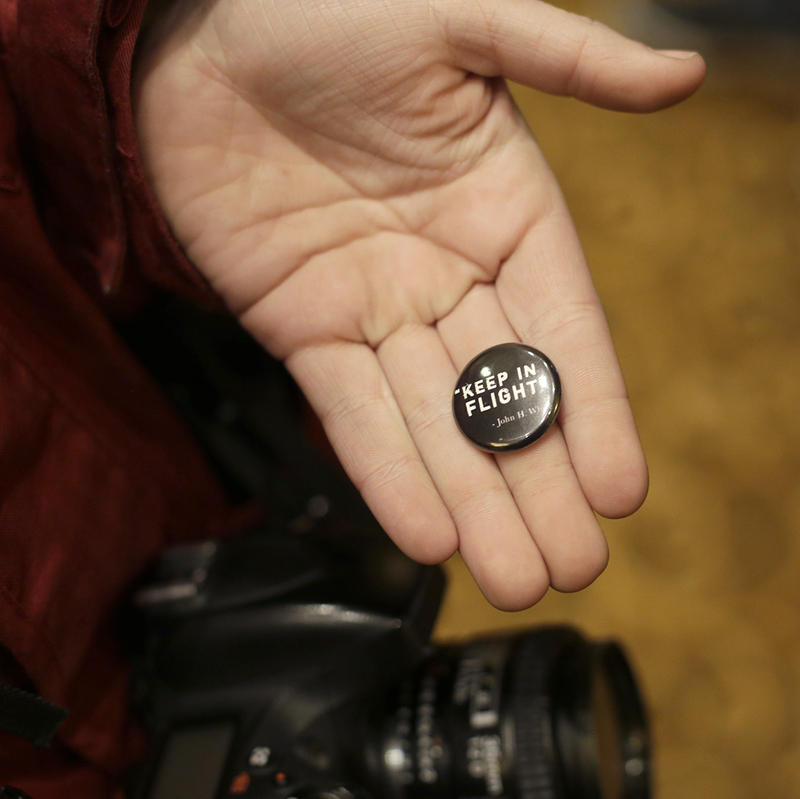 Throughout the conference White handed out buttons with his saying “Keep in Flight” printed on them. Senior Chelsae Ketchum talks to National Geographer Ami Vitale. Marcus Yan, a photographer for The Seattle Times, talks in the gallery with Emily Lambillotte and Eslah Attar. On the return trip back home a few stops were made at Scarborough State Beach in Narragansett, RI and Liberty State Park. 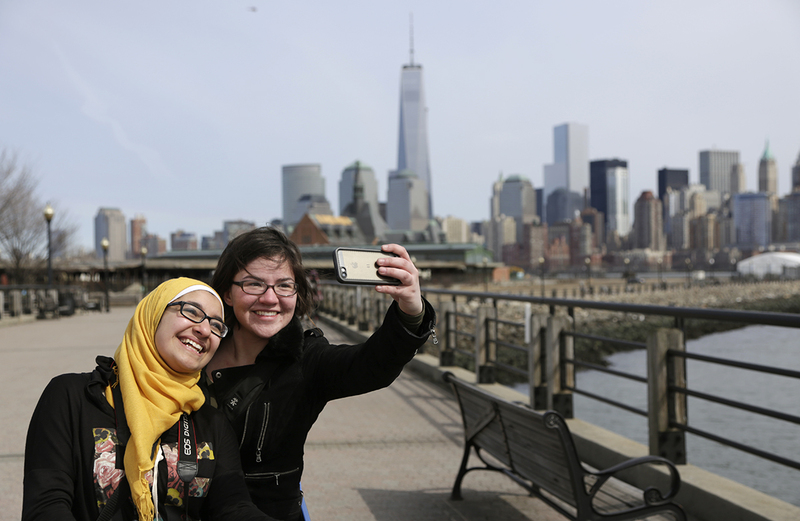 Here Eslah Attar and Melanie Nesteruk take a selfie with the lower Manhattan skyline in the background. Kent State junior guard Chris Brewer looks for an open pass at the men’s basketball game against Akron University on Friday, March 7, 2014 at the James A. Rhodes Arena. 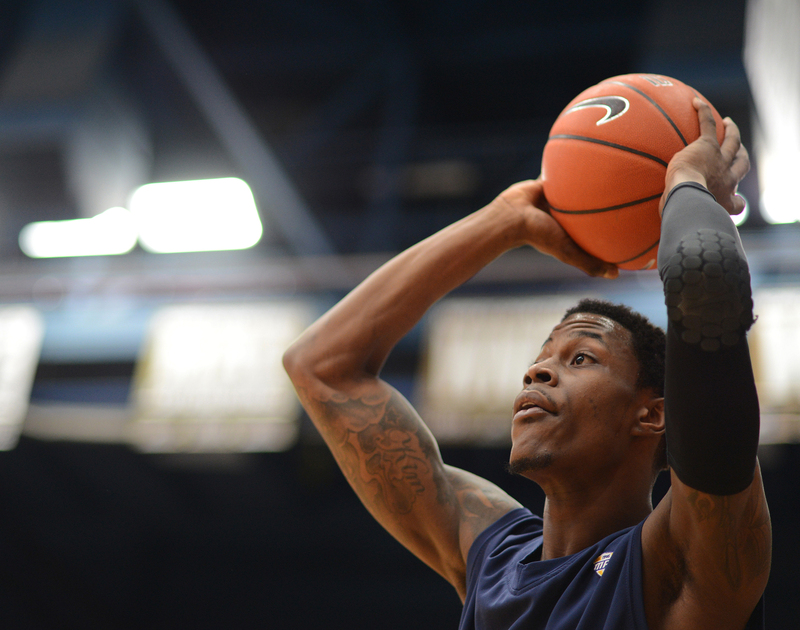 The Flashes lost to Akron 54-58. 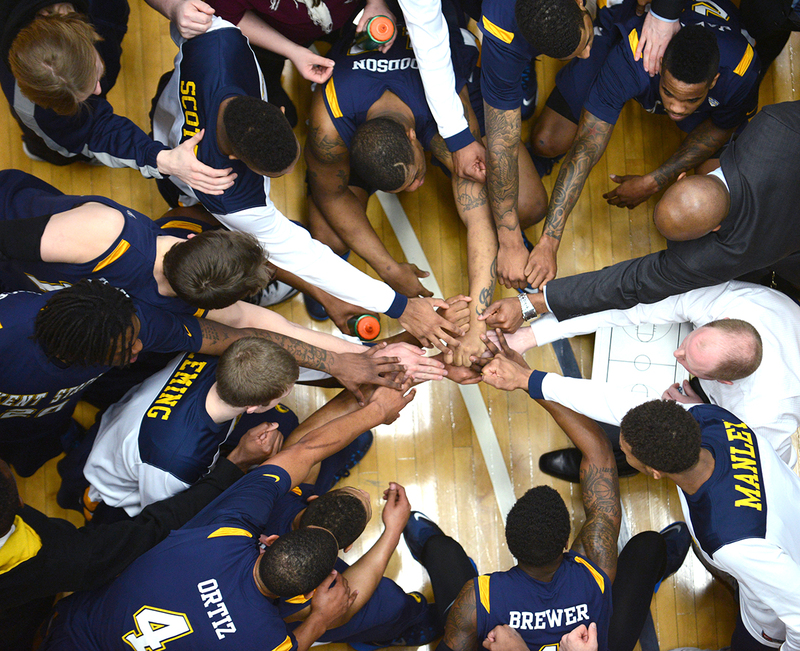 The Kent State men’s basketball team take a time-out at the game against Akron University on Friday, March 7, 2014 at the James A. Rhodes Arena. The Flashes lost to Akron 54-58. 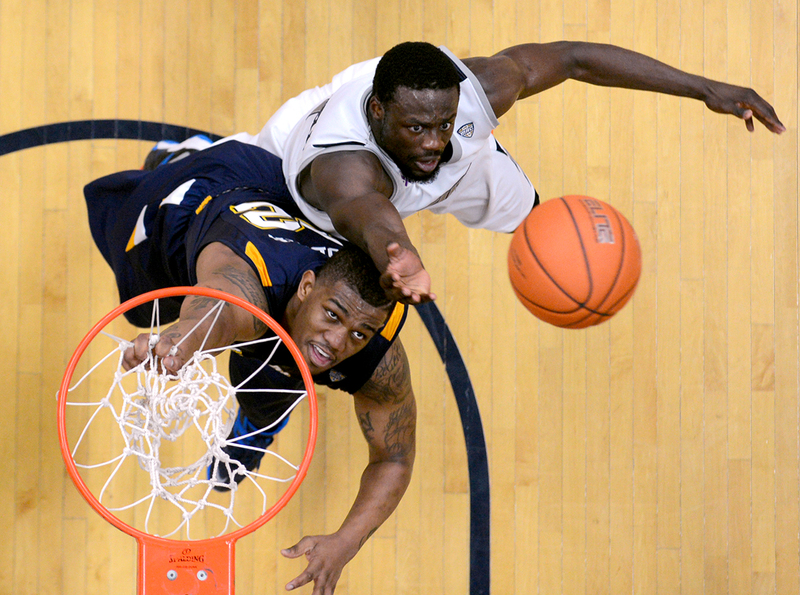 Kent State senior forward Darren Goodson fights for a rebound against Akron University’s senior forward Demetrius “Tree” Treadwell on Friday, March 7, 2014 at the James A. Rhodes Arena. The Flashes lost to Akron 54-58. 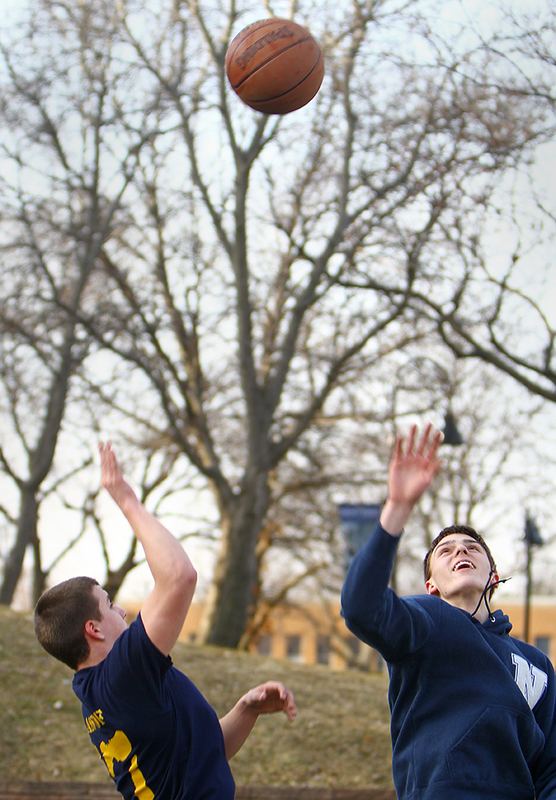 Marketing freshman Kevin Killian and exploratory freshman Jared Rodic take advantage of warm weather for the day to participate in a quick game of one-on-one, Monday, March 10, 2014. Kent State’s Michael DePalma wins his final match at the 2014 MAC Championship wrestling meet Sunday, March 8, 2014 in the M.A.C. Center. DePalma’s final defeat against an Ohio University player wins him third place in his weight class. EMILY LAMBILLOTTE | DAILY KENT STATER Rock the Runway model and Senior HDFS major Jenelle Motely styles the first place winning clothing line titled “Depinned” by Phanstashia Hall on Saturday evening March 8, 2014. 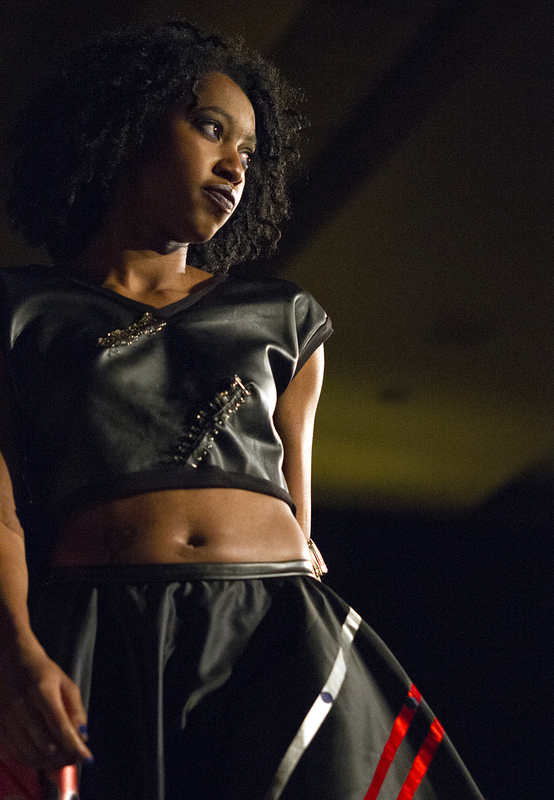 Michelle Milfort, junior fashion design major and designer of the line Surrender, anxiously waits backstage for her models to go to walk during the 10th annual Rock the Runway show on Saturday March 8, 2014. 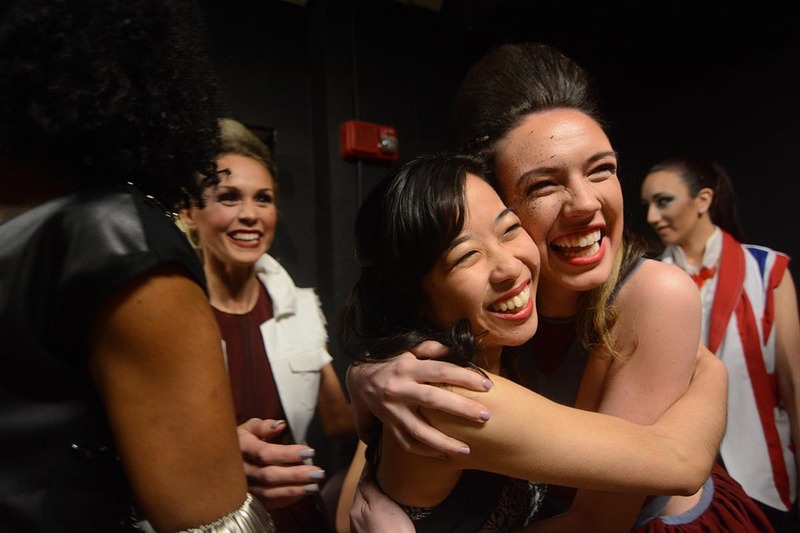 Sarah Pohan, junior fashion merchandising major, embraces the designer of her group’s line, Susy Mei, after discovering they placed in the top three at Rock the Runway on Saturday March 8, 2014.